You can’t market strategically until you have your business strategy in place, period. Successful B2B companies understand that strategic marketing isn’t an end in itself; it’s a necessary tool to achieve their goals. For that reason, marketing strategy must always align with and follow the company’s overall business strategy. 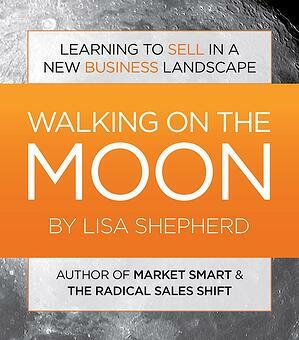 Over the next few months, I’m devoting a blog to each of the 8 Lessons for Successful Strategic Marketing featured in my book, Walking On The Moon. (In case you missed them, you can find Lesson #1 here, and Lesson #2 here.) Lesson #3 discusses why good marketing strategy always supports your business strategy. It’s important to also understand that good marketing can’t happen if there isn’t a solid business strategy in place. If a company doesn’t know where it’s going, no amount of marketing will get it there. WHAT IS THE DIFFERENCE BETWEEN A BUSINESS AND A MARKETING STRATEGY? Your business strategy is your long-term plan of where you want your company to go, along with a step-by-step map of how you’re going to get there. Your business strategy must set the overall objectives you want to accomplish and have goals in place along the way to help you track and achieve your objectives. Your marketing strategy, on the other hand, is the road map of marketing activities that will help you achieve your business goals. Your marketing strategy is there to support your business strategy. then you are poised and ready to build a marketing strategy to support your business goals. Marketers can play an instrumental role in helping your company devise its business strategy. Marketing planning workshops can help you define your priority target markets, messaging and positioning to enable everyone in your company to get focused and improve performance. When we begin working on a marketing plan for a new client, we spend hours learning about the company’s origins, current status and future plans. Through this process, we aim to achieve an intimate understanding of the company as well learn about their business strategy. But what we often find is that the client’s business strategy isn’t necessarily all that solid. Sometimes they even struggle to describe their competitive advantage to us. Having a firm understanding of who your company is and where you want to take it is crucial. You need both a mission and a vision to move forward. A recent study found that 60% of employees don’t even know their company’s vision.1 This is a sobering thought. If your employees don’t know you, how will prospective and current customers? Defining your company’s direction, as well as how your company is different from others and how you better meet customer needs defines your value proposition and shapes how you will be able to achieve your objectives. We’ve been told countless times that going through this first phase of discovery with clients has actually forced them to hone their business strategy. Needless to say, without having a succinct strategy that the company and all the employees can own will hold your business back. Having a clear business strategy will help guide you to make the right decisions, keep you on the right track and will also help inform a solid marketing strategy. If you want practical guidance that details the steps you need to take to build your business strategy, you can read our blog here. If you have your business strategy in place but are struggling with your marketing strategy, let’s talk. We’ll help you develop a successful plan for now and the future. Facebook Ads or Google Ads: What’s In Your Marketing Plan?